A Greek Cypriot political party leader was forced to distance himself this week from one of his own European election candidates after she claimed that “Cyprus is Greek”. Averof Neofytou, head of Democratic Rally (DISY), the biggest party in South Cyprus’s parliament, stopped short, however, of apologising or condemning Strasbourg hopeful Eleni Stavrou following a backlash over a social media post. 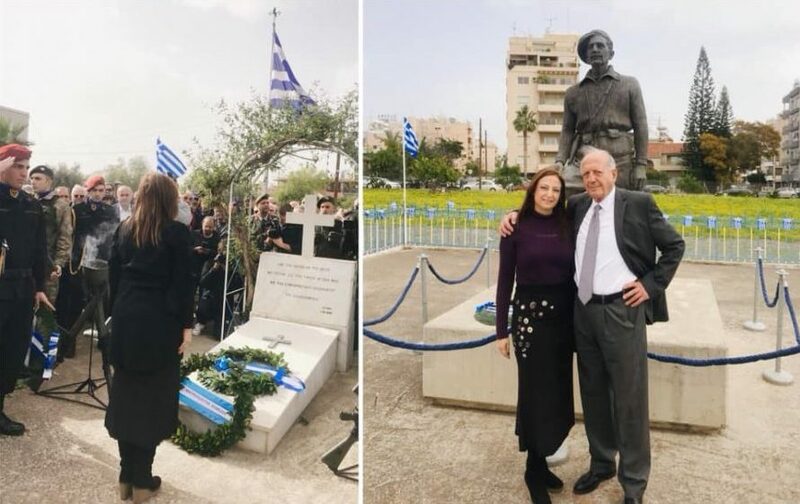 The uproar was sparked last Sunday, 27 January, when Stavrou, a DISY MP, posted on Facebook photos from a visit showing a statute of EOKA terror group leader General ‘Dighenis’ Grivas flanked by two Greek flags. 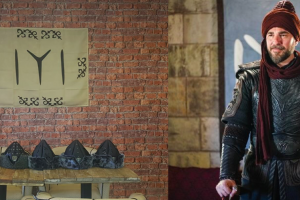 The images were accompanied by a message in Greek that read: “Dighenis is not flesh to be consumed by the earth, he is a noble ideal! Immortal! Georgios Grivas established EOKA in 1955 to conduct a campaign of terror chiefly aimed at British colonial forces but which also targeted fellow Greek Cypriots and Turkish Cypriots. Almost 400 British servicemen were killed during what was known as the “Cyprus Emergency” before the island became independent in 1960. The goal of Grivas, together with Archbishop Makarios, was to rid the island of British rule and achieve “Enosis” – union with Greece. Grivas failed to achieve that objective because of the brave resistance of Turkish Cypriot fighters and ultimately Turkey’s military intervention in 1974 following a Greek-led coup, which occurred just six months after his death. The comments by Stavrou sparked howls of protest from Turkish Cypriots and non-Turkish Cypriots alike, who took to Twitter to take Mr Neofytou to task. The criticism drew a response from Mr Neofytou, who replied via Twitter that Enosis has not been an issue “for decades”. “Our only concern is to reunite our country in the UN agreed framework and live in peace with our t/c compatriots,” he added. On Tuesday Greek Cypriot media reports said that Dr Stavrou had been forced to “tone down” her views. She “clarified” in a fresh Facebook post that while “people who fought in the struggle should be honoured and memorialised, union with Greece is no longer a political goal” and that she had “merely referred historically to the uprising against British rule”. “Shielding and safeguarding the statehood of the European Republic of Cyprus, with all its attendant institutional advantages, are our prime objectives,” she was quoted as saying. Dr Stavrou is one of DISY’s candidates for this May’s European Parliament elections. The party currently has two out of the six MEPs for Cyprus, all of who are Greek Cypriot politicians, despite Turkish Cypriots being officially regarded as EU citizens. The outcry over her remarks came less than a week after a Turkish Cypriot academic was widely criticised for his decision to stand as a candidate for the Greek Cypriot communist party AKEL. Professor Niyazi Kızılyürek, head of the Turkish studies and Middle Eastern studies department at the South’s University of Cyprus, was officially unveiled as one of the main opposition party’s six candidates last Saturday, despite not being an AKEL member. Prof Kızılyürek had previously said that he would do “everything I can”to make Turkish Cypriots visible on the international stage. He said he would also “involve”himself with the problems of Greek Cypriots as well as Turkish Cypriots for “permanent peace and a Europe free of racism and xenophobia”. Prof Kızılyürek’s candidacy was met with dismay by the leaders of political parties in the Turkish Republic of Northern Cyprus (TRNC). 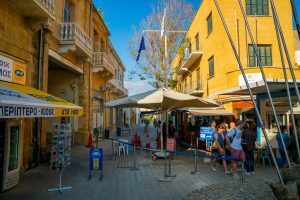 Although Turkish Cypriots are allowed to vote in the elections, they can only do so at special polling stations set up and run by the Greek Cypriot authorities. As a result, the main Turkish Cypriot political parties have boycotted the elections. In 2014, there was further controversy when thousands of Turkish Cypriot voters were reportedly left off electoral lists, meaning that many were unable to cast their ballot. Commentators say that if Turkish Cypriots were able to fully participate in the European elections, then two of the island’s MEPs would be from North Cyprus. On Monday, 21 January, parties across the political spectrum were united in their view that Kızılyürek does not represent Turkish Cypriots. “Turkish Cypriots can only be represented by people elected by Turkish Cypriots”Prime Minister and Republican Turkish Party leader Tufan Erhürman said during a debate on the issue in the TRNC Parliament. Deputy Prime Minister and People’s Party leader Kudret Özersay said that a person cannot “automatically” represent the Turkish Cypriot people “just because he or she is a Turkish Cypriot”. Social Democratic Party leader and Education Minister Cemal Özyiğit said that while he “respected” Kızılyürek’s decision to run for AKEL, he shared the view of his coalition partners. He called on European Parliament elections to be held in the TRNC, just as the “Annan Plan” referendum was in 2004, when separate, simultaneous votes on a solution to the Cyprus problem were held on both sides of the divide. Main opposition National Unity Party leader Ersin Tatar warned that “other games are being played” and that it is “important that we, as a parliament, issue a declaration on this issue”. Prof Kızılyürek’s candidacy had “nothing to do” with Turkish Cypriots, he added. Opposition Rebirth Party head Erhan Arıklı also stated his “disapproval and rejection” of Kızılyürek’s move. Parliamentary Speaker Teberrüken Uluçay promised to launch an initiative “both within the European Parliament as well as the Parliamentary Assembly of the Council of Europe to inform EU member countries on the representation of Turkish Cypriots”. Meanwhile controversial newspaper editor Şener Levent announced this week his intention to run as an independent candidate for the Euro poll and that political parties were “welcome”to support his candidacy. Mr Levent was also a candidate in the 2014 elections, when he picked up almost 3,000 votes, or around one per cent of the total cast.